With each batch specially crafted, Aberlour A'bunadh is a unique cask strength whisky that has achieved cult status among whisky connoisseurs. 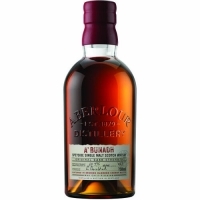 Meaning ‘the original' in Gaelic, A'bunadh is made in homage to Aberlour's founder, James Fleming, using only traditional methods without chill filtration or other modern processes. The result is a heavier, creamier single malt than most have ever experienced - memorably flavorsome, with an intense raisin character.